France is renowned for antiques markets and brocante sales where you can rummage through an eclectic mix of anything from local bric-a-brac to vintage clothes, furniture and sought after antiquities. Many of our properties feature furnishings and décor picked up from local sales. Shopping this way is great fun and an effective way to add authentic French character to your home, or unearth unique and beautiful things to collect – you never know what treasures you may find! This annual outdoor flea market is one of the largest in France with over 3,500 stalls to explore! There is so much to see with dealers offering everything from vintage fashions and toys to old coins and stamps, war memorabilia and decorative items for your home. The market stretches along the banks of the canal that runs through the picturesque city of Rennes. For more ideas on what to see and do on your visit see our guide to 48 hours in Rennes. An annual fayre of about 450 exhibitors that takes place in the Loire commune of Durtal. The stalls are laid out along the castle walls of the city and the market has a reputation for high quality merchandise – bargain hunters come from all over Europe and sometimes even further to see what treasure can be found! Rare coins, ceramics, silverware, books, jewellery, fashion, paintings and all kinds of antiques are on display for collectors, dealers and sharp eyed amateurs to browse and buy. A bi-annual flea market in Aquitaine that features over 200 exhibitors offering antique and vintage furniture and decorative objects, books, jewellery and all sorts of unusual collectables from times gone by. It’s a mecca for dealers and collectors, and a fascinating place to visit for tourists with the added bonus of a Wine and Ham Fair and a beautiful flower market at the Spring event. This huge flea market attracts around 120 exhibitors to sell a wide range of furniture and objects from 18th century antiques right up to iconic vintage pieces from the 1980s. Generally regarded as one of the higher quality and consequently pricier markets it’s still well worth a rummage for fantastic collectors items without the retail mark-up. A fun day out in the beautiful city of Toulose – don’t miss the fabulous food of the region while you’re there! This weekly market assembles around 95 dealers in one of the most well-known flea markets of Southern France. Avignon provides a stunning backdrop with stalls gathering along the medieval city walls to sell pottery, glass, collectables, ancient tools and local antiquities. Visitors come from far and wide to buy for business and pleasure – prices are fair and the atmosphere is friendly. A great place to visit on your French adventure whether you’re buying or just a spectator, for the best opportunities to haggle try going later in the day. 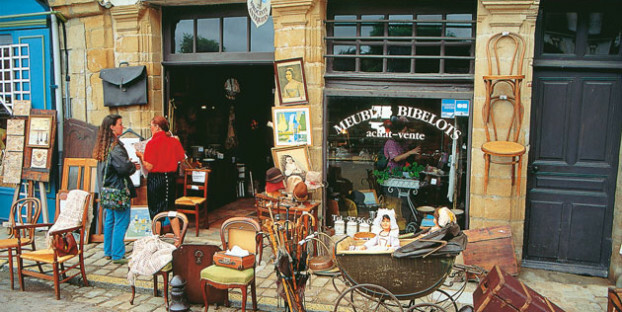 25km from Avignon you’ll find Isle sur la Sorgue, a Provencal village famous for its antiques. There’s around 300 antique dealers and second hand stores based here! Twice a year in Spring and Summer the village plays host to major antiques fairs too (including the International Art & Antiques Fair), welcoming a further 450 exhibitors to make these some of the biggest fayres in Europe. Discover ceramics, furniture, collectables and memorabilia at every turn – make sure you stay nearby to take full advantage of this village of Aladdin’s Caves – a day trip may not be enough for true enthusiasts!